On April 21, 1865, a funeral train carrying the body of President Abraham Lincoln left Washington D.C. and traversed a 1,654-mile course through seven states and 180 cities on its way to a May 4 interment in Springfield at Oak Ridge Cemetery. The actual train car that housed his remains during the journey ended up in a field outside of Minneapolis, Minn. and was destroyed by a prairie fire in 1911. Souvenir hunters flocked to the burned wreckage, with one man retrieving a piece of wood that had framed a window. It was encased in a glass bottle, and more than a century later, a small sliver was taken from it. Layers of paint were eventually removed to reveal the exterior color of the original Lincoln funeral car. The information helped further the construction project of making a full-size replica. 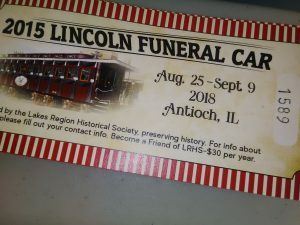 The Lincoln funeral train car was built in Elgin and is now snaking over the same route followed by the original train in 1865. While capable of traveling by rail, the car’s transportation is done with two tractor-flatbed trailer trucks, one hauling the car, and the other hauling its 16 iron wheels. The car arrived in Antioch Aug. 24 for installation, near the bandshell on Orchard and Depot streets, where it will be open for tours, from 9 a.m. to 6 p.m. daily through Sept. 9. The cost is $5, and the money goes toward fundraising efforts for the Lakes Region Historical Society. The nonprofit group is seeking help to replace the bell tower and tuck-pointing on its school and museum. 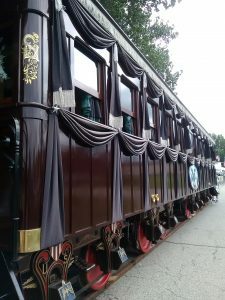 The train car’s exterior is “99 percent authentic,” and modeled from photographs of the era. The interior is not as certain, though fairly accurate, compiled from witness statements and sketches. It has period furniture and items, and exudes a sense of melancholy in walking through the sitting room to the back area where the President’s mortal remains were housed. The tour mixes factual information with anecdotes about the replica’s construction. One tidbit is that the actual coffin was smaller in width, when compared to the formal coffin, so that it would accommodate the train car door when removed for viewing in each city. The car was originally built for Lincoln as a presidential car, but he refused such luxury, considering it “ostentatious,” with the Civil War still raging. Also, of note, the original 1865 car had “double trucks” for its rail gauge size, due to varying gauges in use around the country, at that time. 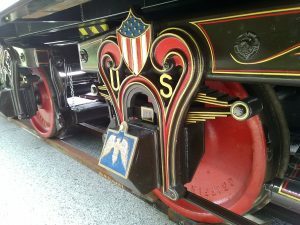 The replica took 2 1/2 years to build, with a standard 4-foot-8.5-inch gauge. The painted Eagle emblem on the side is handmade from an 1865 photograph used as reference. 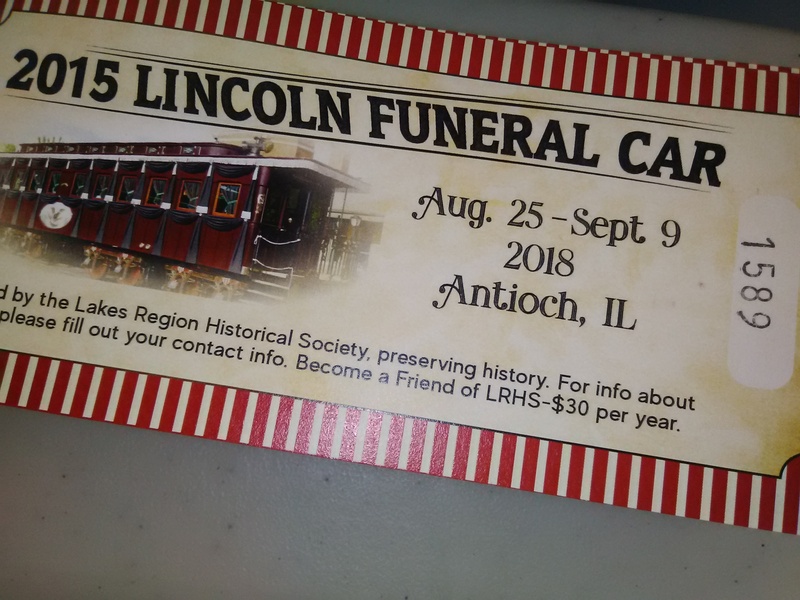 “This is the last opportunity to see the train car in the Midwest, as it is going to another historical society,” said Wonderling. The new home will be in Elizabethtown, Pa., where railroad buff David Kloke owns a locomotive and heavy equipment repair business. A steam locomotive has already been built to pull the car over the fields there.